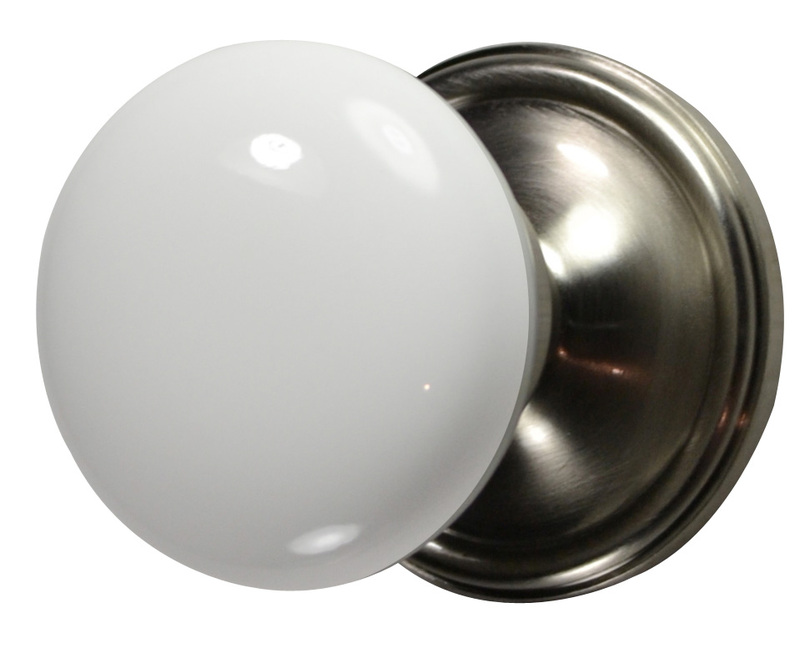 White Porcelain Door Knob (Brushed Nickel Victorian Plate) - genuine white porcelain and measures 2 3/8 inches in diameter (approximate) and has a projection of 2 1/4 inches. The solid brass rosette plate measure 2 1/2 inches in diameter with a screw spacing of 2 inches. Made for modern doors with a 2 1/8 inch bore hole. The dummy door knob is a fixed knob with double rosettes and is commonly used on French-style or bi-fold doors. This style is available as a single sided dummy knob (1 fixed knob), double sided dummy knob (2 fixed knobs), functional passage (non-locking) and functional privacy (locking) sets. Functional door knobs come with a standard 2 3/8 inch back set, or you can request a 2 3/4 inch back set at no extra charge. Porcelain doorknobs gained popularity in the United States during the Victorian era and were first mass produced during the industrial revolution. The original colors available were only black and white knobs. During this time period the style of hardware used in the home was considered a focal point of design. This set is available in a variety of finishes, styles, and functions. We assemble all of the door knob sets here in Michigan. If you require some custom work - simply contact us and we will work with you.